Olympus Lucky Emblems in Kingdom Hearts 3 are Mickey head silhouette collectibles hidden across the stage. Some KH3 Lucky Mickey Head emblems in Olympus are out in the open, but others are much more difficult to find. To find all twelve lucky emblems in Olympus, you’ll have to work pretty hard, and explore every single nook and cranny. Or, you can just read our Kingdom Hearts 3 Lucky Marks – Olympus Hidden Mickey Emblems guide to show you where to find all twelve the Lucky Emblem locations. To find the first Lucky Mickey Emblem in the Thebes area of Olympus, you should start at the second fast travel point; the one with all the columns in the picture. Go down the stairs all the way, then hang a left. Make your way through the rubble, and then turn left when you reach the wooden boards. You should be on the rooftops now. Carefully make your way down from the roofs to the area with three pillars and a warrior statue below. The Mickey head is to the right of a tapestry depicting a bull fight, just next to a short staircase. To find the second hidden Mickey in Thebes, head forwards from the first Olympus spawn point, then take a left from the statue of Hercules. Climb up the stairs surrounded by the construction sites, then take a right, and climb up another staircase. Straight ahead of you, there’ll be a chunk of fallen ceiling. Hop over it and keep going straight on. You’ll come across the Mickey head on a bunch of ruined masonry, next to a large, golden disc. The third emblem is near the first fast travel point in Olympus. From the point, head forward to the statue of Hercules. If you look straight beyond the statue, you’ll see some stairs leading up into a temple. The Mickey Lucky emblem is kinda painted on the stairs themselves. For the fourth hidden Mickey emblem in Olympus, travel to the second spawn point, as described with the first emblem. Head up the stairs right next to you. As you go up, you’ll come across a landing decorated with some potted trees. The Mickey head is on the wall, next to the left pair of trees. 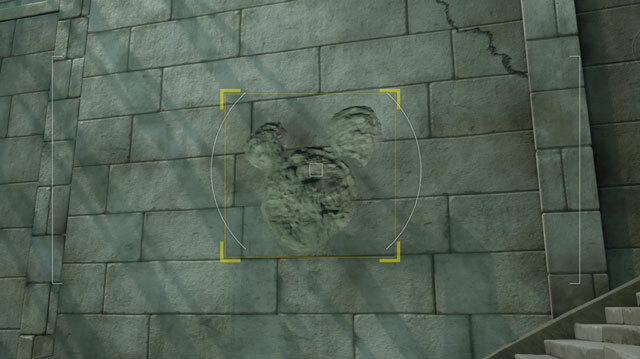 The location of the fifth Mickey Head emblem can be reached from the entrance into the Mount Olympus zone. You can get there from the first fast travel point in Thebes, and just going the opposite direction than you started. Head up the hill, and hop over the rocks to cross the stream. Keep going up until you reach the pillars built into the cliff side. There’s a white wall you can run up to the left of said pillars. From the top, head right and up the white rocks. You’ll now be next to a statue of Perseus holding Medusa’s head. Turn left and climb up the white walls until you reach a stone arch. Mickey is hiding on the right pillar. For the sixth Lucky emblem, follow the steps described for Mickey Head 5. Up the hill, up the white wall left of the pillars in the cliff, up the rocks on the right. When you reach the statue of Perseus holding Medusa’s head, go right. Head down this new path until you reach a waterfall. Kill the enemies, so that the water slows down to almost a trickle. The Mickey head is just right of the waterfall, about halfway up. The way to Lucky Emblem 7 begins by running up the waterfall described just above. Hang a left, then climb another wall. Hop over the chasm, and run up anther waterfall, then up the cliff. Take the left path from the small cave, towards the trees. Look over the edge of the precipice, and you’ll see the Mickey Head emblem made out of a rock formation, on top of a huge spire. Olympus Lucky Emblem Mickey Head number 8 will require some work. First, go to the fourth fast travel point in the zone (the picture shows a majestic, heavenly view of the steps leading into Olympus proper). Double back from the fast travel point, back to the rainy, stormy section. Follow the path, and fling yourself from the hugely tall wall. Keep going down the path, and into the small, open cave. There’s a tree there, and the vines form the silhouette of he Lucky Mickey emblem. KH3 Realm of the Gods Lucky Emblem Locations – Where to Find Mickey Heads? The first Lucky Emblem Mickey head in the Realm of the Gods (ninth overall in Olympus) is near the Realm of the Gods fast travel point (the fifth one, with clouds and a long staircase). From the fast travel point, go up the small staircase right in front, and enter the alcove. The emblem is in the far right corner, on another short staircase. The next, tenth one is close by. Hop onto the blue track to the left of the previous emblem, and right it all the way up. Clear out the enemies, and look at the wall across from the place where the blue track left you. Boom, Lucky Emblem. Go back down the blue track, and climb up the stairs above Lucky Emblem 9. Ride the long, blue track onwards, then turn right. Let the water carry you over the cliff; don’t worry, you’ll land safely. When you do, climb down the stairs, and approach the center of the chamber. The Mickey head is engraved on the huge anvil. For the final, twelfth Lucky Emblem in Olympus, start from the Realm of the Gods fast travel point. Head left, up the ramp, and go straight until you reach the light you can ride. That’s exactly what you have to do; mind the enemies, though. Once on the other side, head left and up the stairs. Look over the vista on the left, and you’ll spot the Mickey head made of clouds.